Scientists in Siberia are preparing for the formation of a massive new crater, which will be even bigger than an existing one. The researchers believe the sinkhole will be caused by a blast in the permafrost, though they are keeping its location under wraps. The scientists have located a so-called ‘hillock of swelling,’ which is abnormal in terms of size and form, according to Vladimir Olenchenko, a senior researcher at the Institute of Petroleum Geology and Geophysics in the city of Novosibirsk. He added that the new possible sinkhole is not far from and will be bigger than a massive crater, which was formed last year in Solikamsk. “We are keeping the coordinates of its location a secret so that this will not lead to a pilgrimage of the scientists and quasi-scientists, as it can explode at anytime,” said Olenchenko. The scientists are planning to keep track of how quickly this new crater may develop by using aerial and space footage. The giant Siberian sinkhole, which was discovered in 2014, is located not far from Gazprom’s Bovanenkovo gas field in Russia’s northern Yamal Peninsula. The 80-meter hole has been gradually filling up with water and is turning into a lake. It currently has a depth of 10 meters, but researchers say it will continue to rise, according to the government website of the Yamal-Nenetsky region. “The crater is gradually turning into a lake. We proved that it is a natural phenomenon; there are no technogenic reasons for this formation. This is not a rocket or an explosion of a gas pipeline, this is a natural process,” Olenchenko added. 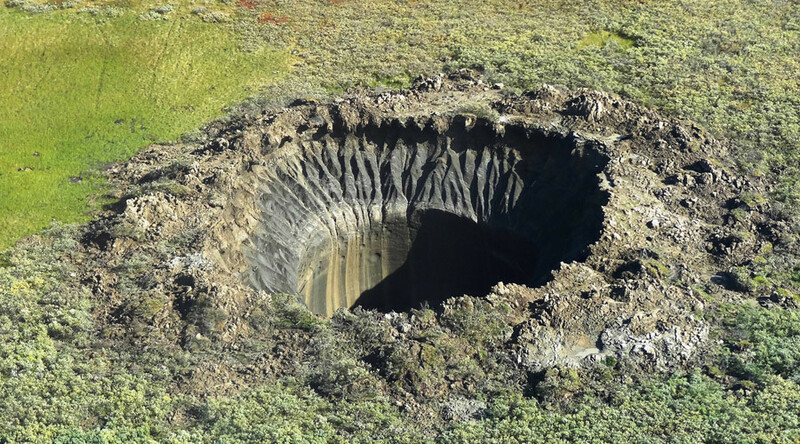 Scientists confirmed that around 20 mini-craters have recently formed around the sinkhole in Solikamsk over the last year, while locals have also discovered other depressions. The discoveries have led to a number of theories concerning how they were created. These range from a UFO invasion, to the consequences of global warming. Experts believe that underground explosions caused by the release of gas hydrates were the reason for the crater’s formation. They had previously warned that rising temperatures will trigger the melting of the surrounding permafrost and the discharge of large amounts of gas hydrartes, which contain as much as 10 times more carbon than the atmosphere. They say this will have a negative impact on the environment.